Drones are becoming more accessible these days. Taking one out to fly a few times may make you feel like a professional drone pilot. They are so easy to operate, you’ll feel like a master in no time. But, don’t be fooled by these toy-like flying machines. They can pose serious risks – especially if they stop working mid-flight and crash into people. Drone safety should be considered even before flying that drone. Drone photography, videography, or racing are rewarding and fun activities. You will keep them that way so long as you keep everyone (and everything including the drone) safe. Most mishaps can be prevented if critical conditions are assessed and addressed before flying the drone. With that in mind, we’ve compiled this drone safety pre-flight checklist and collected what we think are the most critical non-negotiable requirements before flying your drone to avoid crashing your drone or injuring someone while flying. Learn critical lessons and gain experience before flying your drone. This is actually not part of the regular preflight checklist but this is essential if you have no prior experience. Before flying a drone, how do you gain experience without crashing your drone? The key is to fly one using a drone simulator. As they say in archery, ‘It’s the archer, not the arrow’. So you need to be ready and not rely on the anti-crash features of your drone. Videomaker has compiled a list of recommended drone simulators you can use to gain experience. If buying the drone has already burned your budget to get a simulator, you can start with small steps instead and fly the drone low on big open spaces. Wait for a day with only a gentle breeze at most. Winds high enough to tip the drone sideways when just starting to take-off are too high for safe flying. Make sure the batteries are fully charged. We want to emphasize this because it is the most critical thing that is completely controllable by the pilot. Without enough juice, the drone will just stop working in the middle of the flight, and crash. A fully charged battery lets you make sure you get the longest flight possible. More juice means more time to recover in cases where the weather makes it hard to get the drone to fly back home. Check the weather to be certain the drone can handle it. For novice drone enthusiasts a maximum of 10 mph wind speed is recommended for drone safety. To check the potential wind speed on the flight, you can check the wind speed from the ground by using an anemometer or a weather meter. Most of the time, the wind speed in flight is higher than the wind speed at ground level where the anemometer is reading. So make allowances for this difference by assuming that an anemometer reading of 5 mph is a safe reading for starters. 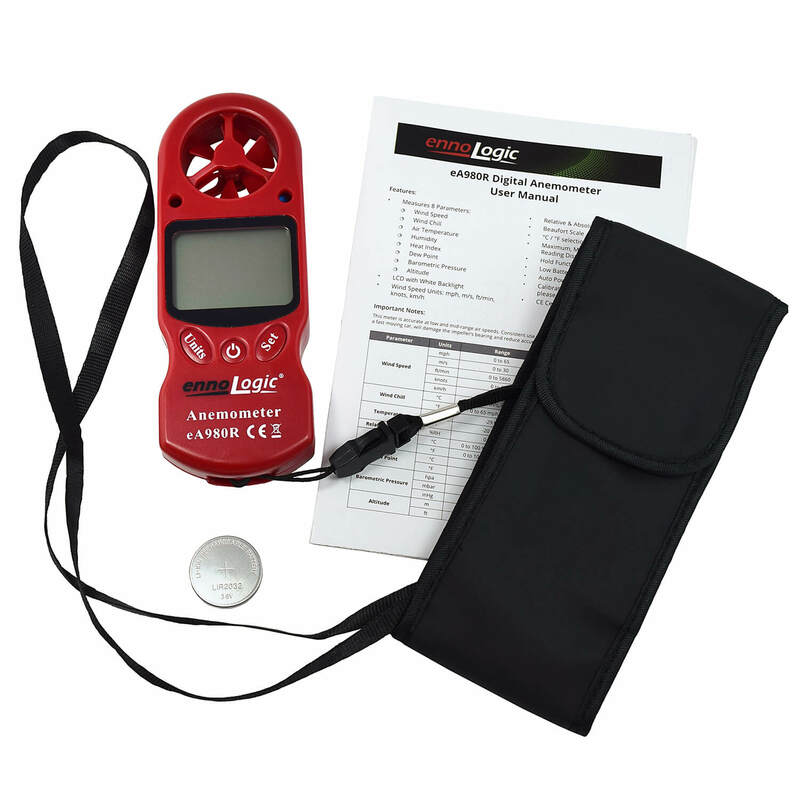 Improve drone safety with the 8-parameter all weather anemometer. Oh, and by the way, if there is an impending rain, do not risk it! Be familiar with the flight location and plan your range of flight. Check the UAV Forecast for any off-limits places in the vicinity and some building structures that you might need to stay clear of. Check as well for any local laws that prohibit flying above certain areas. Some locations require you to contact the local air traffic control tower and ask for permission before flying. Generally, in the US this is within 6 miles of a local airport, but authorities update these regulations regularly as more and more drones take to the air, so check before you fly. It is critical for drone safety to have your drone in sight at all times. You can make adjustments based on the drone’s immediate environment this way. You’ll never know if a bird is about to attack your drone if you cannot see it. It’s best to have someone else be on the lookout for any unforeseen risks. That way, while you’re busy capturing the footage or photo, someone else has their eye on the drone. You’ll also need to plan the locations for your drone control operations, both for yourself and anyone you enlist to help you. If you need to move while flying the drone, make sure you have a location to go to that provides you with good visibility of the drone. Have an easier take-off location and landing place. Identify a Plan B landing location. Choose a take-off and landing location where unexpected winds are unlikely or at a minimum. You don’t want your drone tipping to one side while it’s just getting into the air. You won’t have a smooth landing this way, either, so look for locations where there are natural wind blocks or objects to block the wind or at least reduce wind speed. The wind block should minimize the wind but provide a wide open enough space for navigating the drone. Some good locations might be between minor streets where there are walls to block the wind. In this video, the pilot has chosen a good take-off and landing position. Just in case a situation comes up where your drone cannot land or has difficulty reaching your original landing location, identifying a Plan B landing location can provide a much-needed sigh of relief. A good alternate landing location is an open space that allows for a softer landing for the drone. You must choose a location free of potential objects you might crash into or damage. You can look at the map for empty lots, grass fields or sandlots, depending on the location. Now that you have this checklist, you’re better equipped and should feel more confident to fly your drone. With the right planning and attention to detail, you’ll have an easier time getting your drone back home from each flight. No one wants an expensive crash, and preparation is key. But developing your skill as a drone pilot is also crucial. Start slow, and you’ll have years of enjoyment ahead of you.